Since the dawn of cinema, films have been constrained by a distinct set of rules determining editing, characters, and more importantly – story structure. Films have always been constricted to a structure we all know as the 3 Act Structure, ever since the days of D.W. Griffith in the 1910s, this formula has been tried and tested for over a century, but every now and then, filmmakers arising, seeking to break this structure and experiment with new ideas of storytelling- like what Nolan did in Memento. Memento tells a story of Leonard, a man suffering from amnesia as he struggles to find his wife’s killer. The nature of his condition led him to leave clues behind for his future self to decipher. The film essentially begins at the end of this story, where we slowly, together with him, decipher the clues he left in the past in an effort to piece the story back together. This form of narrative allows the audience to be put in the perspective of the protagonist, which not only enables us to experience the same level of disorientation, but also to empathize with him as we learn more about the story alongside him. This unique stake and bond we have with Leonard, the main character, makes the twist of the film all the more impactful. Memento belongs to a genre of film known as Neo-Noir, a genre which draws elements from Film Noir. Memento takes these elements and instead of using them to construct a coherent story, the film uses them to subvert audience expectations. The idea of the hardboiled detective, femme fatale, and other noir elements are placed to misdirect the audience, and to an extension, Leonard. Not only is the story information presented to us by the film unreliable, but so is every bit of information leading up to whichever conclusion we’ve drawn thus far, leading us as the audience to be constantly questioning what we see on the screen, trying to decipher fact from fiction, regardless of how miniscule and inconsequential the information is, or how logical the conclusion might be, which adds to the feeling of disorientation. This brings us to the central theme of the film- truth. Memento asks the audience if the truth presented to us is really the truth, or is it simply what we perceive to be true and tell ourselves that it’s true in order to reinforce that fact? Watching the film to the end (or rather, the beginning) we learn that the entire story of the film is set in motion after Leonard, unable to come to terms with the reality that he killed his wife, sent himself on a bogus journey to find her killer, and as a result, drawn many people into his web of lies. Nolan expertly explores this theme by putting us deep into the psyche of his character, making us ponder whether or not Leonard was indeed right, because is the truth really important? In conclusion, Memento is one of the most unique films in terms of the way its story is told, and it is also the film responsible for turning Nolan into one of the greatest and most sought after filmmakers of the 21st century. It speaks wonders for his storytelling ability, which he displayed to great extent in his later works. However, a part of me wishes he, or any other filmmaker went back to this extremely formalist style of narrative, but ever since Memento, and Gaspar Noe’s Irreversible 2 years later, there has not truly been any notable film shot in such a distinct fashion. Maybe it’s time for filmmakers to stop playing it safe and start experimenting again? – According to Christopher Nolan, actress Carrie-Anne Moss shot her scenes for her character, Natalie, for the film in eight days. – This movie marks the first in a long-time collaboration between director Christopher Nolan and cinematographer Wally Pfister where they would go about to make an additional six movies together before Pfister became a director himself. – The UK version of the DVD release contained a hidden feature which allowed the film to be watched in exact chronological order. However, the viewer can only unlock this order version by solving puzzles. – During the opening week of Memento, it opened in no more than 11 theatres but by week 11, it was distributed to more than 500 theatres, grossing over $25 Million domestically (USA). – Every major studio passed on the film and regretted it. 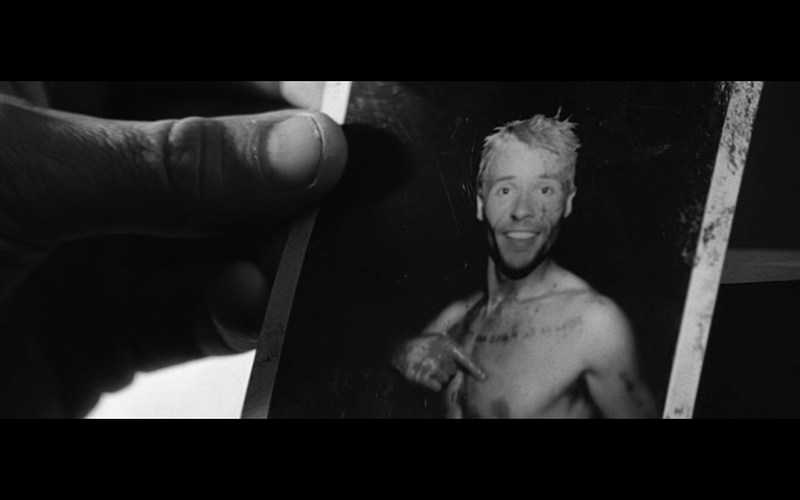 – Memento took around 25 days to shoot.